(VEN) - “It only takes a second for tragedy to strike,” said Jerald Barnes, Corporate Relations Director of The UPS Foundation. “Safety Delivered’s media campaign is playing an important role in spreading this message and raising awareness among youth of the dangers of distracted driving”. The darker side of the popular emoji icon was revealed to audiences across Vietnam in a newly launched distracted driving campaign targeted at 15 to 29-year-olds. 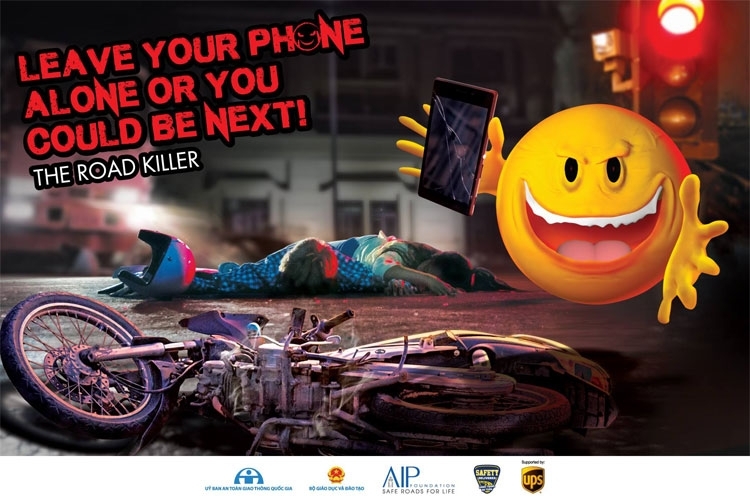 The campaign’s slogan is “Leave your phone alone or you could be next!” and features a sinister, evil emoji character as its key visual. The two associated TV commercials will be broadcast on national and provincial television channels; shown on televisions at target universities and at Cho Ray Hospital in Ho Chi Minh City; incorporated into the communications plans for 63 provincial traffic safety committees; and disseminated through digital channels via an online media campaign. Thirty billboards featuring the campaign’s message will also be installed at 10 target universities as a constant reminder for students on their commute to and from school. AIP Foundation is leading the initiative as part of The UPS Foundation-supported Safety Delivered program and working in close consultation with the National Road Safety Committee, Ministry of Education, and target universities. According to baseline surveys of 927 male and female students from seven universities in Ho Chi Minh City and Hanoi, 79% of students reported having used a mobile phone at least once while driving in the past six months. This represents a troubling reality, considering the World Health Organization found that a driver talking on a mobile phone is four times more likely to be involved in a road crash than one who is not. Safety Delivered is supported by The UPS Foundation and implemented in Cambodia, Myanmar, Thailand and Vietnam.